The 2011-12 season was one of the best volleyball seasons for the Varsity Boys team. Throughout the season the guys dominated games and steadily improved. In the eyes of the other schools, the boys became a legitimate threat. There were a few speed bumps along the way such as our first loss to TCIS and a minor slump at the end of the conference games but both times the guys fought back to redeem themselves. 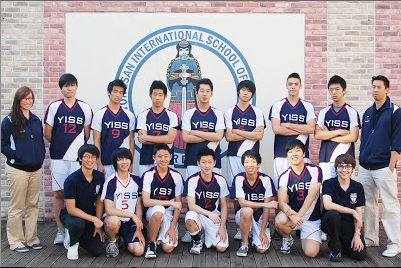 YISS is the only team to beat TCIS this season and there were no signs of a slump in the final KAIAC tournament. The captains Raymond Lee and Andrew Park led the team to a 2nd place finish in the Tournament and into the history books of YISS. They accomplished a feat that last year, nobody would have expected. Overall, it was an amazing season and our boys definitely proved that YISS is a team to look out for on the volleyball scene. Raymond Lee, Andrew Kim and Chris Yoo were the dominating forces on offense, each with 100+ kills. Raymond Lee had the most with over 150 kills despite missing 4 games. Ben Linssen was a wall and led the defense with blocks. Andrew Park, Steven Kwon and Tatsumi Himoto led in passes. Justin Kang and Daniel Lee came off the bench to fortify the defense and help in getting to the championship game. The most dramatic moment of the season was when Steven Kwon dislocates his finger in the 5th set of the game that leads to the championship game. Steven popped his finger back in, played solid defense and covers the hits which gets the team to the Championship game.